This entry was posted on December 27, 2016 by Jessica Anderson. Customer Service, Product Quality, Flexibility. Our Production Manager Tom with his favorite supplier, Kathy Woods from Tropar. That’s what sets apart our 2016 Vendor of the Year, Tropar Manufacturing. Based in New Jersey and Texas, Tropar has been a privately held company since 1959. 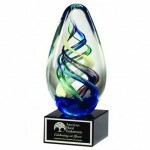 Their brand, Airflyte, consists of high quality plaques, art glass awards, acrylic awards, and desk items. Greg and Peter run the company and our favorite Customer Service Person, Kathy Woods, always takes great care of us when we order. "I nominated them because Kathy and her crew are a pleasure to work with and always accommodate us however they can. Ordering is a breeze and they are always quick to respond to inventory checks or product questions. Also nominated them for their willingness to help us establish our Quickship program which allows us to have a good selection of products on hand that are ready to ship and save on freight costs by not having to order constantly." Our 2014 Product of the Year - Swirl Egg Art Glass, made by Tropar Manufacturing. Some of their best sellers for us include the 2014 Product of the Year Swirl Art Glass Egg, many of our quickship acrylic awards, and many premium plaques, including most of our Made in the USA Solid Wood Plaques. 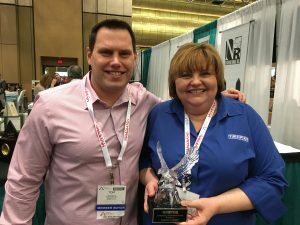 Congratulations to Tropar for being our 2016 Vendor of the Year! Thank you for providing our customers with high quality products and for the great customers service you give to Trophies2Go every day!